Let's face it — most moms aren't running around the park chasing their kids in heels. Rather than wearing tennis shoes everywhere, add a pair of comfortable, yet stylish, flats to your spring wardrobe for a pulled together look. It was so embarrassing the last time I had to wear a pair of heels. I literally fell and almost twisted my ankle... twice! The things we do for fashion. However, I do draw the line at wearing heels to the park. Not only will I look ridiculous but I'll probably end up breaking my leg and then my family will really be in trouble. Rather than lace up a pair of tennis shoes that make me look like I'm always ready to hit the gym, I'm looking forward to adding a pair of chic flats to my shoe closet this spring. Believe me, in these chic flats we'll have no problem running after our kids and looking stylish with any of these four shoe styles. Not quite a ballet flat, yet not quite a sandal, the D'Orsay flat is a hybrid between the two. Essentially a jazzed up ballet flat with a carved out middle, the D'Orsay flat is the perfect option for spring because you wear it casual or dressed up. Coming in solid, colorblocked or metallic styles, you can pair these flats with spring's latest trends like deconstructed jeans and a tee or maxi skirts and dresses for a casual day at the park. If you're headed into the office, pair these flats with tailored ankle pants and a smart blazer for an on trend spring look. 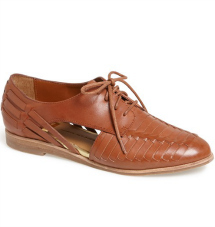 Borrowed from the men, the oxford is a classic flat shoe that has been getting a lot of attention lately. 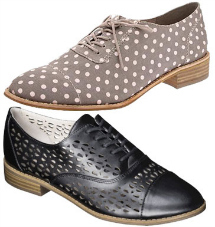 This season the oxford shoe is getting a modern update in prints, with cutouts and perforations. Perfect paired with anything from midi skirts to boyfriend jeans to shorts, the oxford is a fun flat for just about any of your outfits during the spring season. If you live where the weather gets warmer faster, then spring is a great time to get a pedicure and let your feet free from the boots after the cold winter season. The spring season's "it" sandal is a cage sandal. Reminiscent of the shoes worn in ancient Greece, cage sandals are a great option for when you're wearing skirts, dresses or shorts. They are casual by nature and will let you put your best foot forward this spring. Believe it or not, it is fashionable to wear sneakers. We're not talking about your typical lace-up, going to the gym sneakers but rather slip-on sneakers that look great (and not awkward) when paired with everything from shorts to midi skirts. Designers like Jimmy Choo and Prada to more affordable and classic options like Keds and Vans, are jumping on the fashion sneaker trend. You'll find tons of prints, solid color and metallic options for these very comfortable shoes that will soon become your favorite shoe of the season.